Last Saturday was the 45th Worldwide Sketchcrawl, when hundreds of sketchers around the world embarked on sketchathons in their cities and towns. 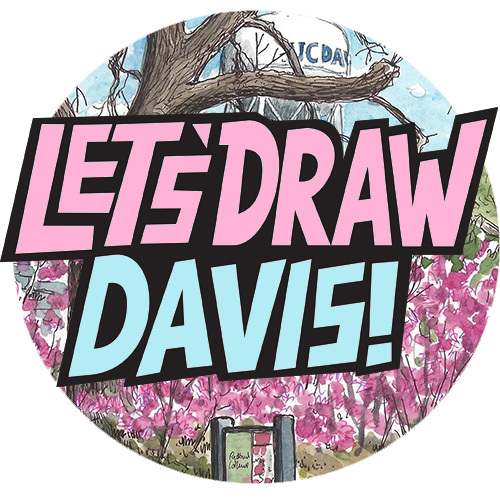 It was time for another ‘Let’s Draw Davis’ sketchcrawl – it had been a year since I organized the last one – and about seven of us met down at David Commons and sketched about town all day, before meeting up again at the E St Plaza. 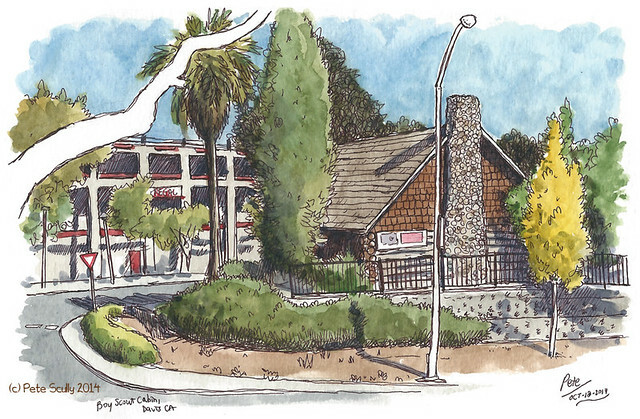 My first sketch was of the Boy Scout Hut, above, which sits across Richards Boulevard on First St, with the ‘art garage’ in the background there. (It’s called the ‘art garage’ because there’s a load of recently commissioned murals and art in there now by local artists; not me though, my drawings are a little too small!). The Boy Scout Hut is no longer used by the scouts, but is now part of the John Natsoulas Gallery. 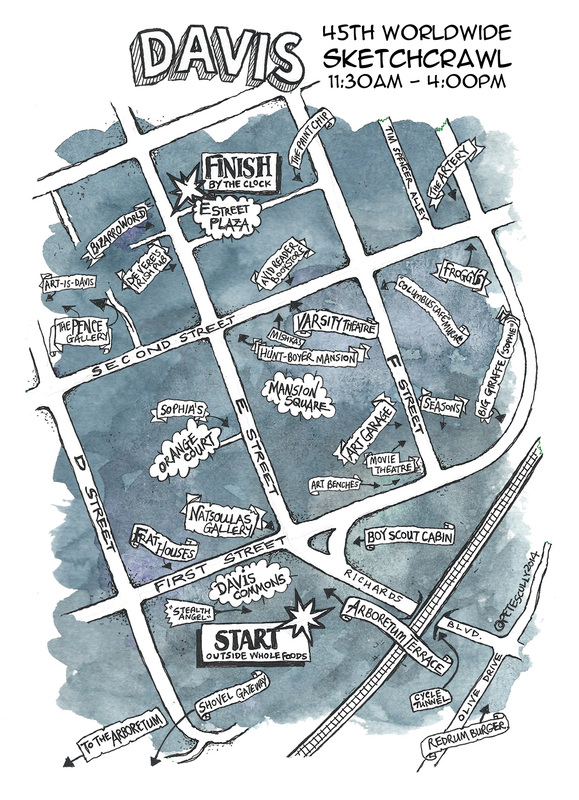 I have sketched this stretch of E St before (above; click on the image for a larger view), but wanted to add this stretch of Davis to my collection of two-page full-colour panoramic spreads. Orange Court is an interesting little spot, which includes such local favourite spots as the Hotdogger, Haute Again, the Dumpling House (they still have the London Fish & Chips sign but I don’t know if they still do it; only ever ate there once, back in 2005 or 2006, it was ok but London fish & chips it wasn’t), and of course Sophia’s Thai Kitchen & Bar, whose curries are my total favourite in this town. Further down the street to the right is the Thai Canteen, who also do really nice food, quite different from Sophia’s, I especially like their green curry rice. Further down the road still are Sugar Daddies (they may be called something else now actually but it still says that in the window) who do amazing cupcakes and I love their Nutella Milkshake. Did I just say “Nutella Milkshake”? Yes I did, yes I did. Come to Davis. 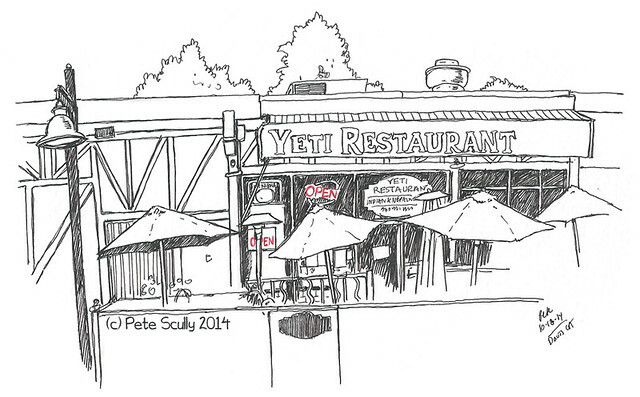 The last sketch of the day (because the panorama took two hours, and I only did about two thirds the colour, finishing off the rest afterwards), was this quick sketch of the colourful front of Yeti Restaurant. I left it in black and white, partly because I used a pen which I knew would run with a wash (the previous sketches were in brown uni-ball signo um-151; this was in the black). I’ve never eaten there, but it’s in a good location on the E Street Plaza. The remaining sketchers from the day met up near here to look at each other’s sketchbooks, and that was nice to see how everyone had interpreted the town. 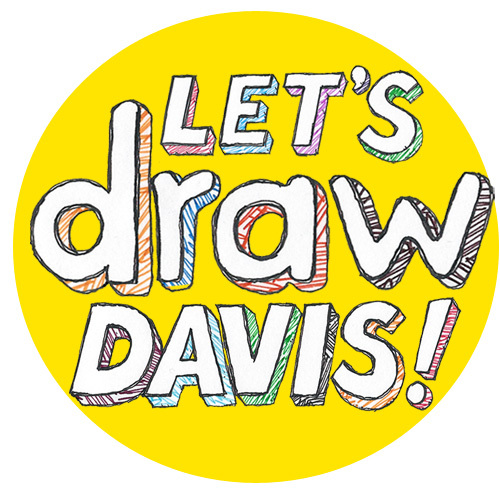 It’s taken me a week to post (what a week it’s been, this depressingly busy October can’t end soon enough), but I’ll be putting them on the Sketchcrawl Forum shortly too. 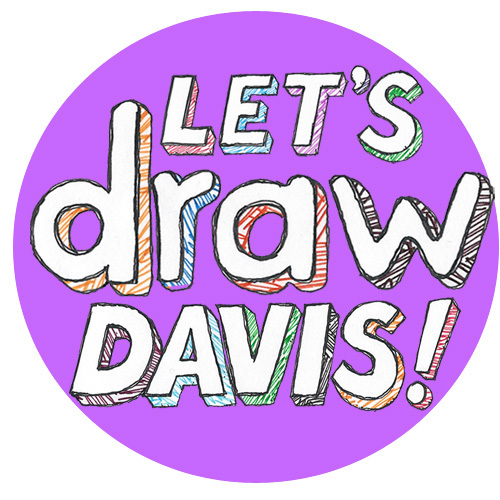 Why not check out the 45th Worldwide Sketchcrawl Forum, and see what everyone else in the world has been sketching? There’s a lot of great urban sketching out there! Outside of England fish and chips never seem to taste the same even when made in a place which claims to be from London…. They’re better in Scotland. Ireland does good fish and chips too. Also in my experience I’ve had better fish and chips outside London, particularly up north, like in Yorkshire. Well nice there. I agree with you about Scottish fish and chips: they are delicious! Never having been to Ireland or Yorkshire, I shall have to put these on my fish-and-chips radar. Thank you! Awesome! I don’t live too far from Davis. Love your sketches. Great write!